If you have a crumblier boudin, feel free to crack those snausages open and just kind of spread the mixture out on the bottom frittata. Do make sure the sausage is cooked first (I believe boudin is typically smoked). Scroll me down, I need this recipe STAT! If your boudin is crumblier, feel free to take it out of the casing and spread it all around. This recipe really seems like more work than it actually is, but it does take a touch of finesse to make sure you don’t break up either frittata in the assembly process. It helps a lot if you let each frittata cool in the pan for about 3-5 minutes before removing, as it will steam the bottom of the pan and prevent it from sticking. The nice thing about this recipe is that the presentation is pretty stellar and because it’s a double stacked frittata, a pretty thin slice is still an ample serving. Throw a fruit salad on the table and conjure up some mimosas and you have brunch for a small crowd. Argentina meets Louisiana in a marriage of boudin and chimichurri. 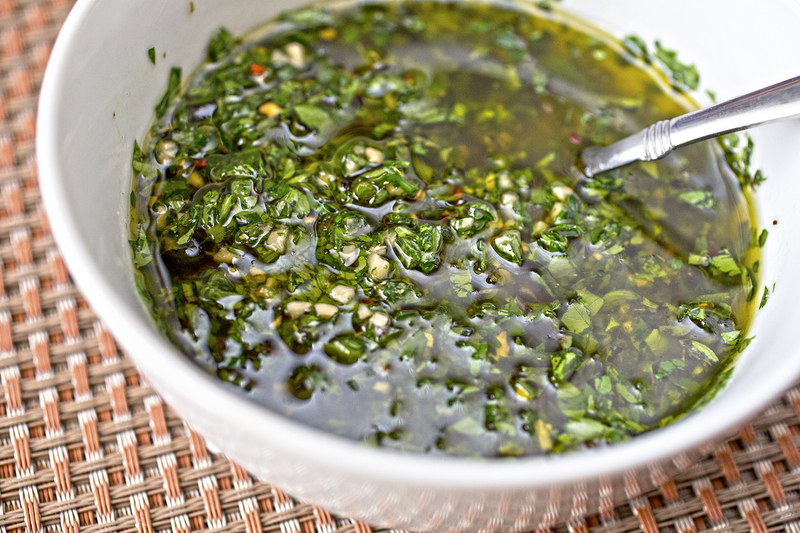 If you’ve never heard of chimichurri, it’s an Argentinian condiment similar to a cheese-less pesto that’s often drizzled over steak or other meats, or anything really. There are about a gazillion different variations to chimichurri, but the basic idea is finely minced fresh herbs (with parsley or cilantro or being the main herb), lemon juice, garlic and maybe a little chile mixed with enough olive oil to form a very loose paste. This one will be fun to play around with, by using a different citrus and maybe incorporating some mint or something, so you will definitely see me using it again. In this recipe, it does a really really good job of cutting through the heat of the boudin, which is nice for anyone with a more sensitive palette. Finely chop the parsley, marjoram, garlic and fresh pepper (if using). Add the lemon juice, olive oil, vinegar, and salt and pepper to taste and set aside. Preheat the oven to 425. Heat a large, oven-safe skillet on medium, add one tablespoon of olive oil and half the chopped shallots. Salt the shallots a touch so they will sweat. At this point, season your beaten eggs with salt and pepper. Once the shallots are wilted, add half of the beaten eggs to the pan. Lightly scramble, scraping up the bottom a little bit, until they are a little less than half way done (2-3 minutes). Put the skillet in the oven to finish cooking, about 5 minutes. Remove from oven and let rest about 5 minutes. You can work on the chimichurri or cook the sausages while you wait. Repeat step 3 with the other half of the shallots and eggs. Once removed from the oven, let sit for about 5 minutes and gently work the frittata off the bottom of the pan. 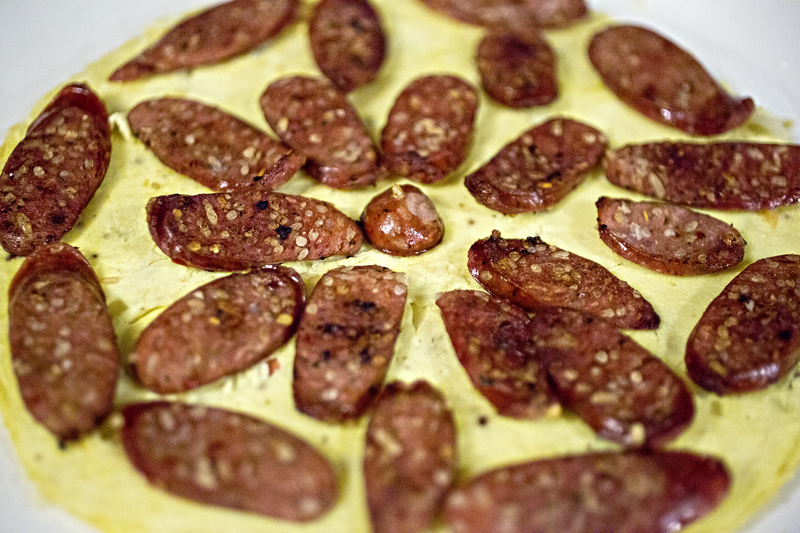 This time, you want to gently lift the frittata out of the pan on top of the first frittata, sausage and chimichurri. This will take at least two broad spatulas, possibly three and an extra set of hands. Garnish the top lightly with more chimichurri and/or some freshly chopped parsley. Slice and serve. Non-game substitution: You can substitute any boudin or even any sausage with this recipe. Vegetarian substitution: It would be super easy to replace the boudin with roasted vegetables or even just the chimichurri.